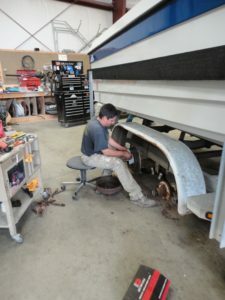 Trailer work is an essential part of owning a small boat. Daivs Boats specializes in all aspects of trailer maintenance, from brakes to wheel alignment, to installing newer electric over hydraulic systems. When you have the experience of towing boats that Harold Davis does you know you are in the right hands when it comes to making sure your trailer is in tip-top condition.